Following the shocking announcement Monday, the AFP cited statements by Benazir Bhutto‘s son and co-chairman of the PPP, 19 year old Bilawal Bhutto, who noted, “After the martyrdom of my mother I said that democracy was the best revenge — and today it was proved true.” He told Geo Television, “Someone from the Pakistan People’s Party would be the next president of Pakistan but I don’t know who that would be.” Bilawal’s father and the effective leader of the PPP, Asif Ali Zardari, is of course rumored to be vying for the now-coveted presidency spot. 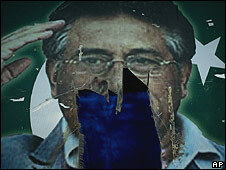 The AP noted in its coverage that television footage “showed groups of people celebrating in the streets in several towns across Pakistan, some of them firing automatic weapons into the sky.” The news agency added, “Musharraf said he will turn in his resignation to the National Assembly speaker on Monday but it was not immediately clear whether it would become effective the same day. The chairman of Pakistan’s Senate, Mian Mohammed Soomro, was poised to take over in the interim.” Pakistan’s foreign minister Shah Mahmood Qureshi said leaders of the ruling coalition would discuss later today whether to prosecute Musharraf in court on charges that that were being planned for the impeachment process, or allow for his safe exit from office. So, in the aftermath of what many are calling a “shocking” decision, how do you feel about Musharraf’s resignation? How did you react to the news? Finally, what do you think is in store for the country next? Musharraf’s spokesman said reports the former army chief’s resignation was imminent were “baseless” but it was clear he has little support. The last of Pakistan‘s four provincial assemblies passed a resolution against him and a key ally acknowledged the president lacks the support to survive a vote in parliament. On Tuesday, the Associated Press reported the provincial assembly of the Northwest Frontier Province (NWFP) also passed a resolution calling for the impeachment of President Pervez Musharraf. The 107-4 vote comes just a day after the Punjab Assembly passed a similar resolution, [see yesterday’s post]. The political battle unfolded as witnesses reported Pakistan’s military rained bombs on militants in a tribal region along the border with Afghanistan in fighting that has killed dozens of people and forced thousands to flee in recent days. There are two obvious questions. The first: Will Musharraf cave to this mounting pressure and exit gracefully? BBC News quoted presidential spokesman Rashif Qureshi, who asserted over the weekend that Musharraf would not step down from office. Qureshi stated, “Everything they are saying is false, so why should he resign?” The BBC added, “The charges are not likely to be presented to parliament until after independence celebrations on Thursday. Before then the government is getting the four provincial assemblies to hold their own votes – which will ask the president to seek a vote of confidence.” [So far, we have seen the near-unanimous results from the Punjab Assembly, see above.] Although the provincial assembly votes will not have any direct bearing on the impeachment process, it will encourage more politicians to call for the president’s resignation, the BBC reported. The coalition, therefore, seeks to increase the heat on the president until he resigns voluntarily. Musharraf would try to draw a distinction between himself and his opponents: Asif Ali Zardari, leader of the majority party in the coalition, the Pakistan People’s Party, and Nawaz Sharif, the leader of the Pakistan Muslim League-N. In the 1990s, both Zardari and Sharif faced corruption charges in Pakistan, and Zardari spent nearly eight years in prison on charges that included paying for a country manor in Britain with illegal gains from Pakistan. On Zardari’s return to Pakistan earlier this year after the assassination of his wife, Benazir Bhutto, the former prime minister, the corruption charges were dropped as part of an amnesty deal with the Musharraf government. PML-Q leaders have publicly asserted their support for Musharraf, and they are not alone. According to Dawn, “The president has been holding meetings with his legal aides and loyalists over the past two days. Prominent among those contacted by the president were PML-Q president Chaudhry Shujaat Hussain, Chaudhry Hamid Nasir Chattha, PML-F chief Pir Pagara, PPP-Sherpao president Aftab Ahmed Khan Sherpao and Awami Muslim League chief Sheikh Rashid Ahmed.” Musharraf loyalists claim the coalition lacks the two-thirds majority needed in the Parliament to constitutionally impeach the president. Perhaps also significant were reports that President Musharraf “abruptly” canceled his trip to the Beijing Olympics amid these “fears that he could be impeached.” Although the AFP reported that the Pakistani president changed his mind soon after and will travel to China for the Olympics opening ceremony, a senior foreign ministry official told the news agency that Musharraf will now fly out Thursday instead of today. Although the official declined to comment on the change of plans, the series of abrupt decisions may be indicative of Musharraf’s concern over the future of his office. His previously planned departure for today also coincided with Zardari and Nawaz’s second round of talks this morning. Perhaps the change of plans may not have been a coincidence at all. Musharraf has stubbornly held on to the presidency despite losing parliamentary backing and public support, and talk hit fresh heights in the past week that he was planning to step down and leave newly elected civilian leaders to run the country. The UK’s Guardian on Friday reported that talk of Musharraf’s resignation “has hit the streets, where rumors are rife of frenetic bag packing and a newly arrived jet to whisk the president into foreign retirement. Stock prices dived last week on the back of the rumors.” This week’s Economist affirmed, “Many Pakistanis think that Pervez Musharraf’s days as their president are numbered.” However despite the volume of rumors reaching a climax, the presidency “swatted away the speculation and said Mr. Musharraf was staying put.” The Guardian cited Musharraf’s spokesman, Rashid Qureshi, who said, “This is absolute lies…He’s not even packed his golf bag.” The Guardian noted, “Qureshi, a long-time loyalist, said Musharraf was being smeared by the Jang group, a media conglomerate which had its television stations shut temporarily by the president last year.” What is certain, noted the news agencies, is that Musharraf has a wide array of very powerful enemies, a fact that could keep rumors abound for a long time to come, should he choose to stay in office.